Cotton has been grown in Australia since the 1800s, but production was small and variable until the modern irrigated industry developed in the 1960s in southern Queensland and northern NSW. The expansion of the modern industry was based at first on varieties from the USA but since the first releases of blight-resistant varieties developed by Norm Thomson in the early 1980s followed by the fungal resistant varieties developed by Peter Reid, CSIRO cotton varieties have come to dominate the Australian market. CSIRO varieties have revolutionised yield, fibre properties and disease resistance in Australia and had large impacts in a number of other countries. Since 1984 new CSIRO cotton varieties have increased yield by two per cent per annum in Australia and growing regions have been extended in NSW and Queensland. Australia has the highest cotton yields in the world and CSIRO varieties are a key component of this system. The introduction of transgenic cotton varieties with insect and herbicide resistance has helped to revolutionise cotton growing in Australia with major reductions in pesticide use (see Cotton pest management [external link]). While cotton has been grown in Australia since the 1800s, production was small and variable until the modern irrigated industry developed in the 1960s in southern Queensland and northern NSW. There was also a brief boom of the modern industry in the Ord Valley in northern Western Australia during the 1960s but insect control problems led to the demise of the industry there in 1973. Norm Thomson worked for CSIRO in the Ord during this period and his experience there influenced his approach to cotton breeding when he moved to Narrabri in 1972 as part of CSIRO consolidating all cotton breeding to one location. Norm was joined by Peter Reid in 1979. Insect pests, particularly Helicoverpa armigera, were a constant challenge in the eastern Australian industry and other problems which soon became evident were diseases such as the fungal infection Verticillium Wilt and Bacterial Blight. The original USA varieties as well as being susceptible to insects and diseases had less than desired fibre quality. Thus Norm Thomson commenced a cotton-breeding program at Narrabri with major strategic aims to rectify the limitations of the USA varieties. In terms of insect resistance he experimented with many morphological and biochemical resistance characters. The most successful of these was the okra leaf shape which has narrow leaflets in contrast to the broad normal leaf. The more open canopy results in a less favourable environment for insects and enables some reduction in pesticide use. The okra leaf character also gives a small improvement in water use efficiency. The range of environments in the cotton industry meant that the breeders aimed to develop varieties with specific adaptation to the different growing areas. Norm Thomson concentrated on fuller season areas and Fred Gillham and Peter Reid focused on shorter season areas and late plantings. A major breakthrough from Norm’s program was the release in 1985 of the variety Siokra 1-1. This was the first okra leaf variety to be widely grown anywhere in the world. As well as the okra leaf shape Siokra had excellent fibre quality and was also resistant to the serious disease bacterial blight. This started a long line of fully blight resistant varieties from CSIRO and has resulted in the elimination of bacterial blight from the Australian cotton industry. In 1987 the release of Sicala 3-1 brought a further advance in fibre quality and the Sicala name soon became synonymous with high quality Australian cotton. Further releases flowed from Norm’s program including the very successful Siokra 1-4 and CS 50. CSIRO varieties soon gained a large market share in Australia and have dominated for most of the period since despite strong competition from Deltapine, a large USA cotton breeding company, which established an Australian operation. Seed of CSIRO varieties is produced and marketed by Cotton Seed Distributors (CSD), a grower controlled company which also developed an overseas operation, Cotton Seed International (CSI), to market CSIRO varieties overseas. The first major releases from Peter Reid’s program were the first Australian varieties with strong resistance to Verticillium Wilt, Sicala V-1 (1991) and Sicala V-2 (1994). These varieties, particularly Sicala V-2, were very widely grown in Australia and became very successful in overseas markets. Greg Constable joined the breeding group in the early 1990s becoming leader of the program and soon after Warwick Stiller joined the program in 1994. Since 1996, a range of transgenic traits to enhance insect and weed control have been introduced to the industry culminating in the present highly popular combination of Monsanto’s Bollgard II-RRFlex traits delivered in CSIRO elite varieties. Up to 2012, the CSIRO cotton breeding team have commercially released 105 varieties. In particular there have been some notable releases which were breakthroughs in one or more characteristics and thus were widely grown. Major conventional varieties in terms of area at different times have been Siokra 1-4, Siokra L23, Siokra V-16, Sicala V-2, CS50, Sicot 189, and Sicot 71. Fusarium Wilt resistance (Sicot F-1). The more modern varieties developed (such as Sicot 71 and Sicot 75) have been more widely adapted as well as combining desired fibre quality, disease resistance and yield. Likewise in the transgenic era there have also been important commercial varieties such as Sicala V-3i, Sicot 289RRi and now Sicot 71BRF. In 2010/11, 500,000 ha (80%) of the Australian cotton crop was sown to Sicot 71BRF in only its second season from release ‘ a prodigious adoption rate, and a testament to the confidence that growers have in the outputs of the CSIRO’s cotton breeding program. Sicot 71BRF was superior to all other varieties available in combining wide regional adaptation, high yield, good fibre quality and high disease resistance with three different GM traits (Monsanto’s Bollgard II and RRFlex transgenic traits, providing both pest resistance and herbicide tolerance). Breeding of this variety occurred over the period 2001 to 2008 by the CSIRO cotton breeding and biotechnology teams in Narrabri and Canberra. Sicot 71BRF represented a special case with unprecedented uptake and success. It was commercially released in 2009 through Cotton Seed Distributors. The area grown to Sicot 71BRF in 2010/11 represented about $1.7b of total value; in increased yield, it directly added over $60m to the value of Australian cotton in one year. During the 1990s drought, Australia lost markets in international spinning because we could not fill orders. Spinners sourced cotton from other countries such as USA, Brazil and West Africa. With the return to full production, the improved fibre quality of Sicot 71BRF enabled spinners to recognise the better quality and so buy from Australia in preference to competitors. Thus, this new variety also helped to maintain and expand our markets and bring longer term prosperity to regional Australia. Royalty and trait fee income to CSIRO will be over $20m in 2010/11 and will continue to accrue, representing a significant return on investment by CSIRO. Results in Texas USA with Sicot 71BRF are also strong. Given CSIRO FiberMax varieties already occupy 60% of the Texan cotton area, it is likely that Sicot 71BRF, marketed as FiberMax, will occupy ~2 million ha, (more than four times the area under cotton in Australia) and provide substantial returns to CSIRO into the future. The strong performance of Sicot 71BRF under dryland conditions has assisted in significant expansion of the area of dryland cotton, continuing the strong impact of CSIRO varieties. Research on the modern CSIRO varieties has shown that increased yield also increases water use efficiency ‘ more yield is being obtained with the same water inputs. The GM traits in Sicot 71BRF have also delivered benefits to growers in more environmentally responsible insect and weed control. The Bt traits in Monsanto’s Bollgard II technology has allowed an 85% reduction of insecticides applied and Roundup Ready Flex technology has allowed a 52% reduction in use of residual herbicides. 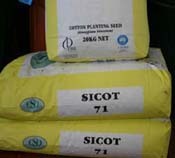 Thus Sicot 71BRF contributes to a better environmental profile for cotton. The CSIRO Plant Industry cotton breeding and biotechnology teams were awarded the 2011 CSIRO Chairman’s Medal in recognition of the outstanding success in delivering a variety which substantially helped Australian cotton growers and communities. Cotton breeding is a very slow, and at times, tedious process with a cycle from initial crossing to commercial release taking up to ten years. Thus success can only come with a long term commitment of staff and funding. Cotton breeders Drs Norm Thompson (1972-96), Peter Reid (1979-2009), Greg Constable (1991 – present), Warwick Stiller (1994 – present) and Shiming Liu (2006 – present) have shown long term dedication to the task. Even after retirement, Norm Thompson and Peter Reid maintained an interest in the program as CSIRO Post-Retirement Fellows. Norm Thompson passed away in 2010. As well as the many years of effort from the scientists mentioned, the group has been very fortunate to have had a number of outstanding senior technicians who have been the backbone of the breeding effort. A number of technical staff have had 15 years or more service (Craig Patrick, Lindsay Heal, Chris Tyson, Max Barnes, Terry Murphy, Kellie Cooper, Kay Smith, Dave Shann and Chris Allen). The cotton breeding group at Narrabri has had excellent support from the cotton industry with funding and also assistance with the very large trial program conducted in all growing areas. Grower cooperation in providing sites for field experiments has been critical in ensuring new breeding material is fully tested before commercialization. The partnership with Cotton Seed Distributors has been outstanding and is a great example of how CSIRO can work with an industry group to provide benefits to farmers and to feed considerable funding back to research. The modern cotton industry which emerged in the 1960s and 1970s at first had a system which produced relatively low yields and mediocre fibre quality while having a constant war with insects and weeds using many chemicals. Through scientific research and also innovation from farmers, the industry has been transformed to one with the highest yields in the world, excellent fibre quality and with a much reduced reliance on pesticides. Johnston B, Healy T, I’ons J, McGregor M, 1992, ‘Rural Research —the pay-off: The returns from research undertaken by the CSIRO Institute of Plant Production and Processing’, CSIRO and ABARE, Canberra. Constable GA, Thomson NJ, Reid PE, 2001, â€œApproaches utilized in breeding and development of cotton cultivars in Australiaâ€. In: Genetic Improvement of Cotton: Emerging Technologies.Jenkins JN and Saha S (Eds). Science Publishers, Enfield. pp 1-15. Anon, 2002, ‘Cotton breeding and decision support. A benefit-cost analysis of CSIRO’s research programs’. Centre for International Economics. Canberra and Sydney. 32pp. Constable GA, 2009, ‘Breeding as a business – return on R&D investment in crop improvement’. 14th Australasian Plant Breeding Conference and 11th SABRAO Congress, Cairns, 2009. The CSIRO cotton breeding program has been recognized by the following awards. Reid PE, 2010, Personal communication. Constable GA, 2012, Personal communication.